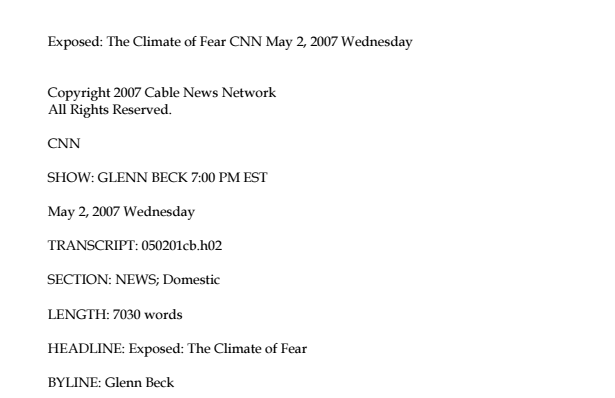 This is the transcript of an hour-long “special report” edition of Glenn Beck’s Headline News show on CNN, aired May 2, 2007 and titled “Exposed: The Climate of Fear.” The show, which Beck proclaimed would present “the other side of the climate debate,” features many prominent industry-funded climate skeptics such as Patrick Michaels, John Christy, Roy Spencer, and Tim Ball. The show portrays climate skeptics who “dare to speak out” as victims of persecution, saying that climate “alarmists” will “belittle, insult and sometimes threaten the lives of those opposing voices until they’re snuffed out and can no longer be heard.” Comparing the rhetoric of the climate movement to that of “eugenics in the 1940s,” Beck says that “every generation has groups that think that they are so right they shouldn’t be questioned,” thus solidifying the moral righteousness of the climate skeptics. Roy Spencer, another climate skeptic often appearing alongside Michaels, pointed to the Oregon Petition as evidence that the “alarmists” were shutting down legitimate scientific debate. The petition, as Spencer describes, was “signed by 19,000 professionals and scientists who don’t agree with the idea that we are causing climate change.” Designed to mimic the style of a prestigious academic journal, the petition prompted the National Academy to publish a news release stating that “the petition project was a deliberate attempt to mislead scientists and to rally them in an attempt to undermine support for the Kyoto Protocol.” The petition also included many fictional signatories, including characters from the TV show M*A*S*H.